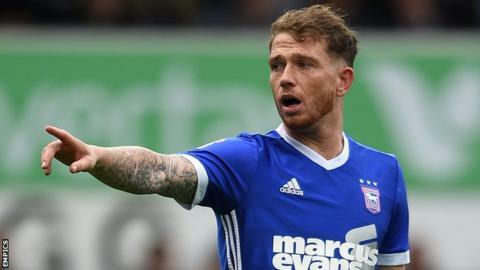 Ipswich Town striker Joe Garner will miss the rest of the Championship season because of a minor skull fracture behind the ear. It follows a clash of heads in the draw with Sheffield United on Saturday. The 29-year-old has also been carrying a knee injury and will have surgery on a shoulder problem on Monday. "He said he was feeling dizzy in the dressing room on Tuesday and we checked him over and pulled him out of the game," said club physio Matt Byard. He told the club website: "It's a small fracture but it is affecting his balance and co-ordination. He doesn't need an operation and it will settle down fine but he needs six to eight weeks off and that means the end of the season." Garner joined Ipswich from Rangers last summer, scoring 10 goals in 32 appearances this term, and joins fellow forward David McGoldrick on the sidelines. "It's a real blow. It's been a blow missing him, it's been a blow having him for the last six to eight weeks not being fully fit and mobile," boss Mick McCarthy told BBC Radio Suffolk. "He's been wheeling himself out and doing it for the good of the team, which is very selfless."